Investors are gravitating toward a new favorite part of the stock market, which seems to have just about everything going for it right now: banks. The sector is nipping on the heels of the technology sector, which has been the best performer since the 2016 presidential election, as investors bet that higher rates, lower taxes, deregulation— not to mention a return to market volatility favorable for investment banks — will keep lifting the industry’s profits. “We’ve been increasing our weight in financials and banks for several reasons: The banks have repaired their balance sheets; financials are trading at attractive valuations; we still think banks are underowned since the financial crisis, they’ll benefit from deregulation; and interest rates are going up,” said Ernie Cecilia, CIO at Bryn Mawr Trust. 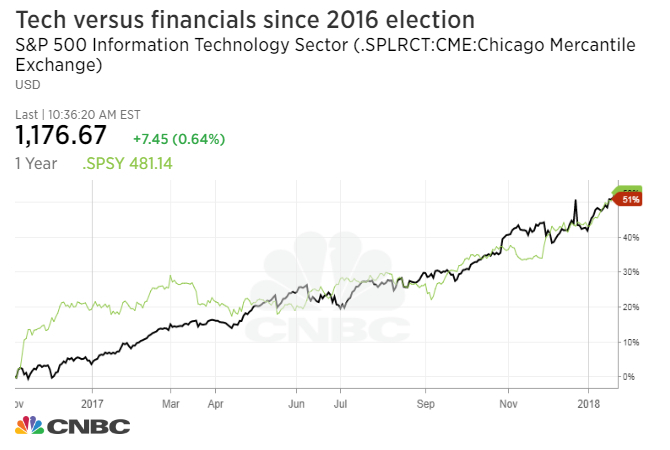 From the 2016 presidential election through Thursday, the S&P 500 technology industry is up 46 percent, but financials are just behind with a 45 percent gain. Interest rates have surged to multiyear highs recently as inflation shows signs of life. The consumer price index — a widely followed metric of inflation — rose 0.5 percent last month, topping a Reuters estimate of 0.3 percent. On Thursday, the benchmark 10-year note yield hit its highest level in four years. The move higher in rates sent jitters through Wall Street recently. In the 10 previous sessions, the S&P 500 has posted eight moves greater than 1 percent. For context, the broad index posted only eight 1 percent moves all of last year. But financials, particularly the big banks, benefit both from higher interest rates and volatility. Higher rates let banks increase lending rates and make it more attractive for people to deposit cash in bank accounts. They also increase the profitability of insurance companies, which sell interest-rate sensitive products. The sector has bounced back 6.9 percent since the S&P 500 closed in correction territory on Feb. 8, or down 10 percent from an all-time high set last month. The broad index, meanwhile, is up about 5.8 percent since then. Pavlik said he was a buyer in the group during the market’s downturn, noting Bank of America is one of the stocks he bought in that time. This rise in volatility should help the big banks since many of them have large trading operations. 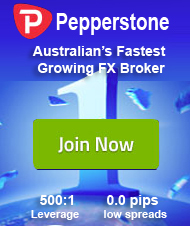 When market volatility picks up, more trades are carried out, boosting trading revenue. Goldman Sachs CEO Lloyd Blankfein said Tuesday the investment banking giant has already poured more money into its trading operation now that markets have become more volatile. Goldman’s fixed income, currencies and commodities trading revenue plummeted 30 percent last year as an unprecedented calm spell hit the market. Many on Wall Street are also expecting the sector to benefit from the recent changes to the tax code. In December, President Donald Trump signed a bill that slashed the corporate tax rate to 21 percent from 35 percent. The move is expected to help increase bank earnings. The Trump administration is also proposing rolling back regulations put in place by previous presidents. Following the financial crisis, banks fell under heavy government scrutiny and were subjected to new rules and oversight. Complying with these regulations increases banks’ operational costs. Rolling them back would, in theory, lower those costs. There are risks to the potential rise in financials, however. Interest rates could come off their multiyear highs (as they did on Friday) if other data indicate inflation remains subdued, making the group seem less attractive to investors. There is also the possibility that Wall Street has discounted how much financials will benefit from these many forces. But some big investors believe there is more left to go. Investor Leon Cooperman of Omega Advisors is also jumping on the financials bandwagon. According to a 13F filing released Wednesday, Omega invested about $37 million in Wells Fargo and nearly $10 million in Citigroup during the fourth quarter of last year. Omega also bought about 140,000 shares of the SPDR S&P Regional Banking ETF (KRE) last quarter. Warren Buffett’s Berkshire Hathaway, meanwhile, increased its stake in Bank of New York Mellon by 10.6 million shares in the fourth quarter of 2017, according to a 13F filing.